Collin after qualifying the 15th Annual Galletta's Greenhouse Karting Klassic 200 of 2010. He was the ceremonial pace kart driver, piloting the Chrusher.com #74. Collin after qualifying the 13th Annual Galletta's Greenhouse Karting Klassic 200 of 2008. He was the ceremonial pace kart driver, piloting the Galletta's #0, which shockingly went un-used that day. Two years later it won the same race piloted by Kyle Reuter, the prior year it finished 2nd with Mike Howell, and in 2002, it finished 2nd with Chris Stevens. Often at Galletta's, good karts sit idle, while people stay home. Again, real racers race, and all the local kart drivers who have heard about our events and don't bother coming out and having fun aren't as good as they think. If they were, they'd be racing at Galletta's, the street cred of Central NY karting. Collin's whole family races karts at Galletta's from time to time when they are in the mood and not quitting. His dad is Gary Miller Sr., and brother is Gary Miller Jr. 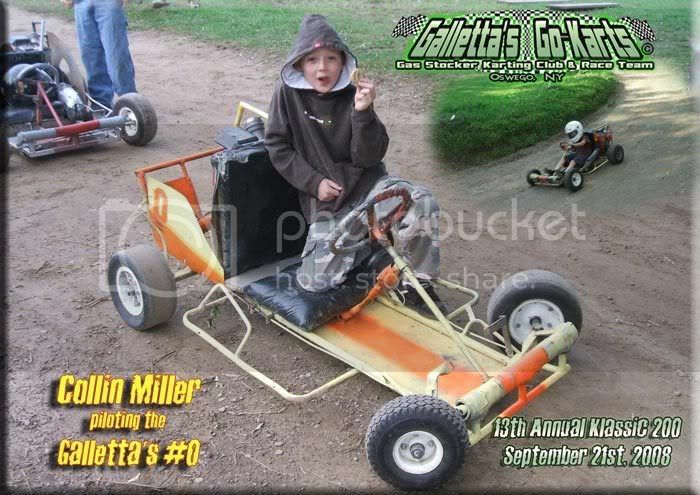 The Galletta's Go-Karting Club was founded by brothers Matt and Chris Stevens in the early 1990s when they modified yard karts for racing purposes. 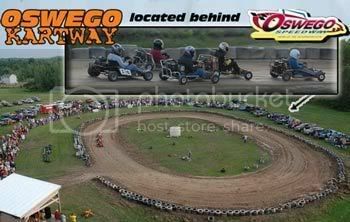 They are the inventors of "clockwise 5hp flathead gas stocker kart" racing, and have a 13-kart race team that includes several backup karts available to be rented and raced at both Galletta's and Oswego Speedway all summer. Invented with specifically "gas stock 5hp motor" rules so that a person doesn't have to spend thousands of dollars to race in extremely competitive racing events, the class grows in talent and competition every single year. Don't believe us? Try it and you'll see. Join us by building your own kart for a few hundred dollars, or rent one of our team karts on Summer Thursdays or Summer Sundays in Oswego, NY! All pictures & text © copyright 2004-2010 Galletta's Stock Karting Club & Chris ChrusherComix (unless noted).